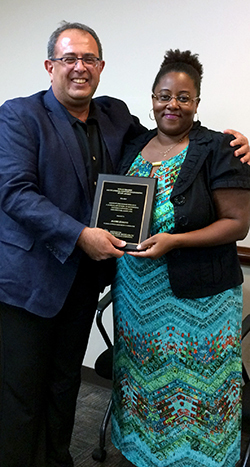 Alexis Jenkins is the 2017 recipient of the ISR Susan Frazier Outstanding Systems Engineering Staff Award. Jenkins is receiving the award for her work in payroll, visas, parking, benefits, visitors and appointments. She is attentive, detail-oriented, dependable and very efficient, always willing to help and answer questions from faculty, staff and students. Jenkins is especially helpful to our many international students and postdocs, helping them annually to fill out all the different forms they need to study in the U.S. Students feel comfortable stopping by her office any time for help with everything from travel to taxes. Jenkins received nomination letters from students, postdocs, and staff. She is a true professional.